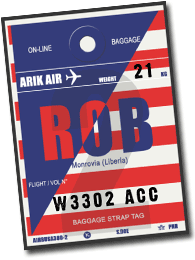 A Liberian-own transportation and car rental services company has launched an airport shuttle service aimed at reducing the inconveniences for people traveling in and out of the country through the Roberts International Airport. Infinity Shuttle Service’s owner, Patricia Adadevoh, disclosed at the launching ceremony on Tuesday that the idea to have an airport transportation service was cultivated out of a quest to address the huge traffic in Monrovia and reduce the number of vehicles plying the Robertsfield Highway. Adadevoh said the service was also started out of a desire to reduce the number of vehicles on the roads and limit the amount of carbon dioxide emissions into the atmosphere. “This will ensure an eco-friendly way of traveling to and from the airport,” she said. She said the company was launched in February 2017 and has been rendering transportation services, including executive door-to-door shuttle services in and out of Monrovia, out-of-town vehicle rentals, and group shuttle services for conferences and other events. Adadevoh also hopes that her company will become the premiere car rental services provider in the country. “To make that happen, we have made customer service our focus. Everything we do, all the decisions we make at Infinity Shuttle Service, we keep our customers and potential customers at the center of those decisions,” she noted. Joseph Johnson, the company’s manager, said the airport transport service will integrate with flight schedules. “For example, if a flight is leaving from RIA at 10:00 in the evening, we tend to leave from here at 5:00 in the evening, to give ourselves ample time to get to the airport so that you can check in,” Johnson said. According to him, even in cases where no passenger is on board of the bus up to departure time, the bus will leave as scheduled to meet the convenience of other passengers who would be waiting to go to the opposite direction, even if it would cause losses to the company. He said one of the goals of the service is to alleviate the burdens of people receiving requests from family members, friends, and relatives for lift to or from the airport. It would help with the difficulty in getting a convenient means of transportation while traveling or entering the country during late hours of the night. He said the company has opened a ticket booth at the airport and intends to serve all commercial flights, which the bus schedules would accommodate. “We are also online, where you can go to pay for your ticket and book your shuttle, if possible,” he said. He noted that there is also a partnership plan with Ecobank that would allow customers pay for tickets online, although that is not in place yet. Johnson noted that the buses dedicated for the airport shuttle service are fully air-conditioned and carry WiFi internet connections. Former Vice President Joseph Boakai performed the official dedicatory ceremony and praised Adadevoh for being one of several Liberians taking ownership of their country by making an investment in the country.